In Shemot 13:19, the verse quotes the oath that Yosef made his brothers and descendants swear about carrying his bones when they leave Egypt. Compare these words in this verse with the actual oath that Yosef said as quoted in the 2nd to last verse in Breishit. The last word "Itchem" that is in the verse in Shemot is not mentioned by Yosef. I viewed the commentaries and they seem to explain what this extra word means. But, according to the way the verse reads, it looks like they are quoting what Yosef actually said. So, did Yosef say the word "Itchem" as part of his oath? If yes, how do we know; If not, why is this word included to make it seem as if he did? Or, is the quote not meant to be exact? Rav Hirsch in Vay'chi 50:25 points out that this oath was not just designed to bind the brothers, but was meant to bind whichever generation actually managed to leave Mitzraim. Thus, he could not make the original oath use the word Itchem. However, when the exodus actually occurred, the oath then took effect and the word "itchem" now applied. One of the purposes of halakhic Midrash was the exegesis of the Bible. In this regard, the halakhic midrash extant for the Book of Exodus comes from the school of R. Ishmael, which is the Mekhilta of Rabbi Ishmael. The word Mekhilta comes from the Aramaic word מכילתא, which means a collection of rules of interpretation, which is what we today would call Biblical Hermeneutics. The midrash recognizes that Moses in the Book of Exodus was quoting words from Joseph that were not recorded in the Book of Genesis. Thus when Moses quoted the expression “with you,” the implication was that Joseph was talking to his brothers whose bones would go with the bones of Joseph. In other words, had the Book of Genesis mentioned the phrase “with you,” the idea in the Book of Genesis would have suggested that the bones of Joseph (and only those of Joseph) move immediately out of Egypt upon his death. The reader of the Book of Genesis could make the logical inference that the Exodus (in the mind of Joseph) was imminent at the time of his death. 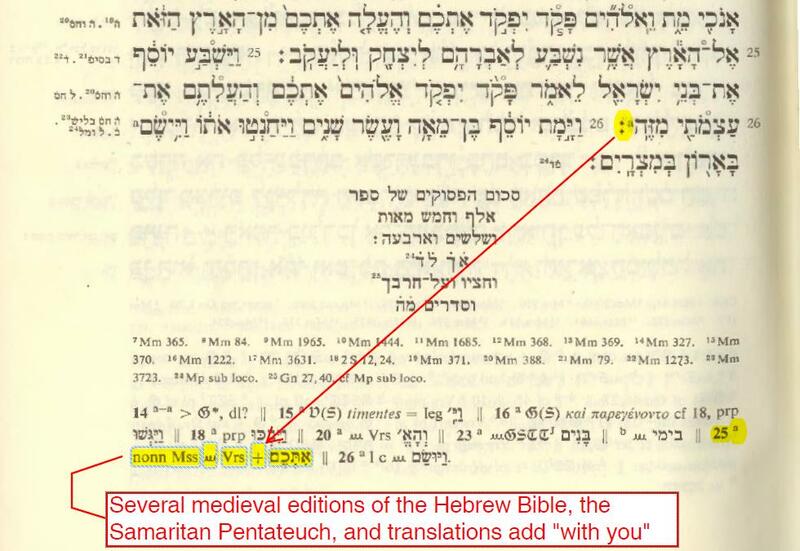 Many manuscripts of the Hebrew Bible (to include the Samaritan Pentateuch) and various other translations have edited and included the words “with you” in the Book of Genesis. While this editorial clarification in the book of Genesis brings the quote into perfect alignment with the quote from Moses in the Book of Exodus, the well-intentioned editorial change loses the very fine and nuanced meaning as discovered by the Mekhilta of Rabbi Ishmael. Lauterbach, Jacob Z. (2004). Mekilta de-Rabbi Ishmael (New ed.). Philadelphia: Jewish Publication Society, 123. Not the answer you're looking for? Browse other questions tagged parshanut-torah-comment beshalach nedarim-shevuot yosef vayechi . Why did Yosef tell over the dreams? Was quail available on Shabbat in the desert? Was Re'uven confessing along with the rest of his brothers regarding what happend to Joseph? How does bringing Binyamin to Egypt prove that the brothers are not spies? How would Yossef's story turn different if he was truly prophesying?